I love this entry at How Stuff Works. Not only is there a good basic explanation of the workings of a sewing machine, but there are two completely mesmerising animated diagrams showing stitch formation. Stare at them too long and you will go into a trance. Lost your sewing machine manual? You're bound to find a replacement here ( ... though admittedly you will have to pay a modest amount for the privilege). Manuals are available as a PDF download or on CD. 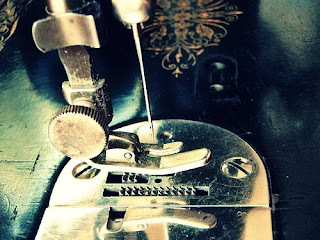 This very handy table at Sewing.org provides a detailed description of the different types of sewing machine needles. The selection includes: universal, ballpoint, twin, overlocker, jean and leather needles. You can always rely on the Dummies site to save the day. If sewing machine needle sizes (including the sizing variations between countries) has you flummoxed, you will appreciate this cheat sheet. This PDF shared by the New Mexico State University says: When you have trouble with your sewing machine, a good rule to follow is “Clean it first.” Many problems are caused by dust, lint or thread ends that have collected on the working parts of the machine. (Lint? Dust? Who'd ever have thunk?) Use their straightforward instructions to perform your own basic machine service. Simplicity Homecare provides basic information and diagrams explaining some common speciality presser feet. Find out more about the overcast, narrow hem, blind hem, cording, darning, applique, gathering, pintuck, roller and 1/4 inch feet. Start a whole presser foot collection! PatternReview.com member Loohoo44 has put together an amazing list of links detailing specialty presser feet and uses. All the links point to PDF files residing at www.sewingmachinesplus.com, but so far as I can see the site has no readily accessible index. What a useful post , thanks so much some of these are going to be very helpful to me . Henceforth, you shall be my sewing encyclopaedia reference for all my students!